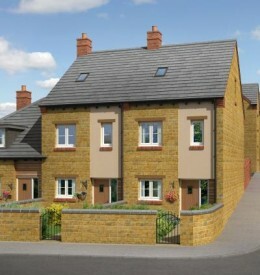 The developer is building two and three-bedroom townhouses at Spratton Mews in High Street, Spratton, using local stone and bricks to blend with nearby properties. The site was formerly home to Ibex House, a post-war warehouse and office building which dominated the area. Ibex House was once a base for children’s clothing and shoe leather manufacturers but the building had been empty since 2008. Planning was given for the new homes in 2009 and renewed in 2012 before Hazelton Homes bought the land. Hazelton Homes specialises in developing sensitive sites and the transformation at Spratton Mews is almost complete. Commercial Director Richard Hazelton said: “Spratton Mews presented a fantastic opportunity to improve the appearance of this part of the village with a carefully designed selection of homes. “Every care has been taken to ensure the new homes sit comfortably alongside the old, with a focus firmly on quality. Spratton Mews has nine three-bedroom house and two houses with two bedrooms. Prices start from £179,950. The view home will be unveiled during the launch weekend on Saturday 3rd and Sunday 4th May. For more information call 07850 770335.